The use of data in communication disciplines like journalism, marketing, advertising, P.R., etc., is becoming widespread. News graphics have quickly become a popular feature in news media, and many organizations, like The New York Times or The Washington Post, have created departments devoted exclusively to dealing with data. Unfortunately, what is otherwise a positive phenomenon has also a dark side: the lack of knowledge that average citizens have about statistical reasoning opens the door for crooks of all ideological orientations to mislead them. 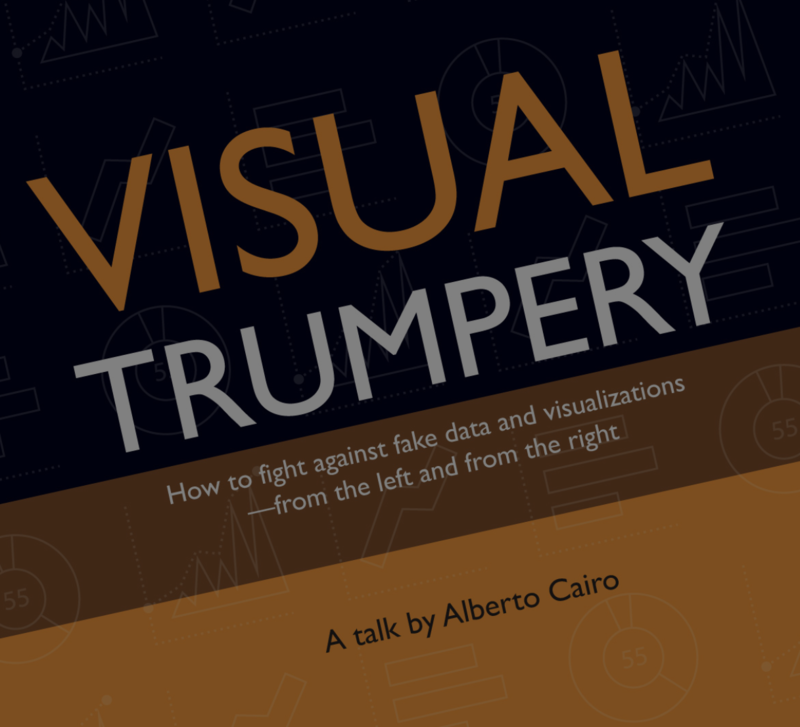 The talk will cover strategies to verify sources, reason about data, and critically read graphics like charts, graphs, diagrams, etc. Alberto is the Knight Chair in Visual Journalism at the School of Communication of the University of Miami (UM). He’s also the director of the visualization program at UM’s Center for Computational Science. Between 2005 and 2009 he was the James H. Shumaker Distinguished Assistant Professor at the School of Communication of the University of North Carolina-Chapel Hill. He’s also been an executive editor at several news publications in Spain and Brazil, such as El Mundo and Época magazine, where he worked as a data journalist and graphics designer. He is the author of the books The Functional Art: An Introduction to Information Graphics and Visualization (2012) and The Truthful Art (2016), both published by Pearson Education. He also works as a permanent consultant for companies like Google and Microsoft, and in occasional projects for SAS, Nielsen, Gallup, McMaster-Carr, etc. In addition to the data visualization community, we invite teachers at all levels to attend. Please invite the teachers you know to join us. They can sign up through EventBrite so that they don’t have to join the Meetup to attend. Please register from Meetup or EventBrite but not both. Thanks to Pearson Publishers who are helping with Alberto’s expenses. You will have an opportunity to see Alberto’s books at the event.